We're excited to introduce a new feature to Money Dashboard - your Weekly Financial Summary. To learn a bit more about the distinction between "Spending" and "Money Out" in Money Dashboard, please read our blog on this subject. 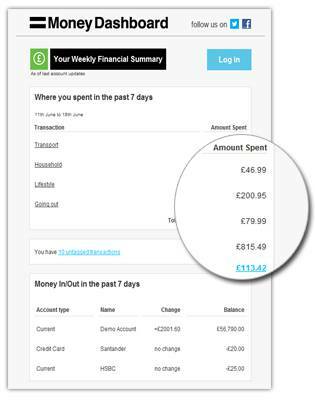 If you haven't already done so, the next time you log in to your Money Dashboard account you will see a pop up screen. This will notify you that the weekly summary email has been switched on. Please check that your email address is up-to-date. Alternatively you can turn the email on or off at any time from your My Profile>Preferences section.